Johann August Wilhelm Neander was born David Mendel. He adopted his new name after he was baptised as a protestant Christian. He became a pupil of G.J. Planck and he was promoted in Heidelberg in 1811 and became a professor in 1812. In 1813 he was called to Berlin. His main work was "Allgemeine Geschichte der christlichen Religion und Kirche" ("General History of the Christian Religion and Church"), 1825-1842. In 1839 he became a member of the Prussian Academy of Sciences. He died in 1850 in Berlin, exhausted and nearly blind. 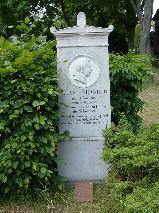 The grave of August Neander at the Kirchhof Jerusalem und Neue Kirche I, Berlin.